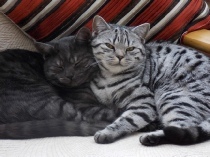 Owing to late cancellations I still have kittens available form Eclipse and Giselle. They are beautiful kittens, and apart from Frederica, are my last Sargenta kittens. Eclipse was spayed at the time of Caesar and Giselle will be done when her kittens have left. It will be sad to the kittens go after so many years of breeding, but alas age and permanent ill-health have now caught up with me. I want to make sure that my cats and kittens are taken care of before I am no longer able to look after them. Fox has been recently re-homed and is with a very nice couple in Wiltshire. I have had some lovely photos back and he looks very happy. It was sad for me when he went, especially as he was the donor cat when Eclipse was so very ill and needed a blood transfusion. She was not stitched up properly after her Caesar and spay by my Vet and lost a lot of blood over night, then needing to be re-operated on the next day. My Vet would not consider doing the Blood Transfusion and she would have died. Thanks to the wonderful Vets at the Meopham Veterinary Hospital and the help of my friend Lynne Bull, who took her there after collecting her from my vet, her life and the lives of all her 6 kittens was saved. She was there for 12 days. I do not know how to put photos on this website, but most can be seen on my Facebook page Ursula Graves. I can also email photos to anyone who is interested in buying one of those kittens. The first litter of kittens were born to Ch Sargenta Silver Eclipse and her daughter Sargenta Silver Giselle today. Both started going into labour together. Giselle gave birth to six kittens, 3 spotted boys and 1 spotted boy, as well as two tabby boys. Eclipse had to have a Caesar and is now very slowly recovering in Hospital with the kittens. She also has 6 kittens 3 x tabby and 3 spotted. 5 girls and one of the tabbies is a boy. This was the first show I attended this year. It was held at Addleston Community Centre in Surrey. I took Ch Sargenta Firecracker (silver spotted) for the first time, after buying him back from Lizz Adair. He was awarded the Reserve Grand, Best of Breed and first in his side classes. 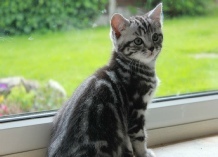 I also took my silver tabby girl Sargenta Silver Frederica (silver tabby). She was awarded her 2nd CC in competition with two others and did well in her side classes. Best of Breed went to Natalie`s stunning boy Ch Jorjeez Diamond Geyser, who was made up to Grand on the Day. Jane drove my car, it was sunny all Day and only started to rain when we got home.